National Parks may be "America's Best Idea" but that hasn't kept some visitors from acting upon dumb ideas while visiting them. Summer is the high season at most national parks, bringing with it more tourists and, as a matter of course, more potential for unusual or bad behavior. This summer has been especially strange for parks across the U.S., with a number of mishaps making the news. In the past, national park visitors needed to be reminded not to litter and to help prevent fires. Now that Smoky Bear is 70, it seems we need a new set of rules for modern visitors to America's parks. In late July, a visitor to the Grand Canyon captured a now viral video of two men luring a squirrel to the edge of the canyon with food. Then, one of the men put on his shoe and kicked the squirrel off the cliff. The act of kicking an animal to its death was not only juvenile and heartless, but the Frenchman who perpetrated it could "face a federal petty offense of disturbing/harassing wildlife with maximum penalties of $5,000 along with six months in jail" if he is found. Drones as aerial video cameras are pretty cool. Even Martha Stewart loves them. But the National Park Service banned the use of unmanned drones in all National Parks on June 27, 2014. Less than two months later, on August 2, a tourist crashed his drone into the Grand Prismatic Spring in Wyoming's Yellowstone National Park. Park rangers have yet to identify the man or find the drone, which may be stuck in the formerly pristine spring forever. Don't Turn Natural Wonders Into Your Personal Playground. Adventure sports and national parks go together. But some parks have become so popular with thrill seekers that the peace of the park, as well as the integrity of the monuments within them, have come under threat. Case in point is Utah's Arches National Park. 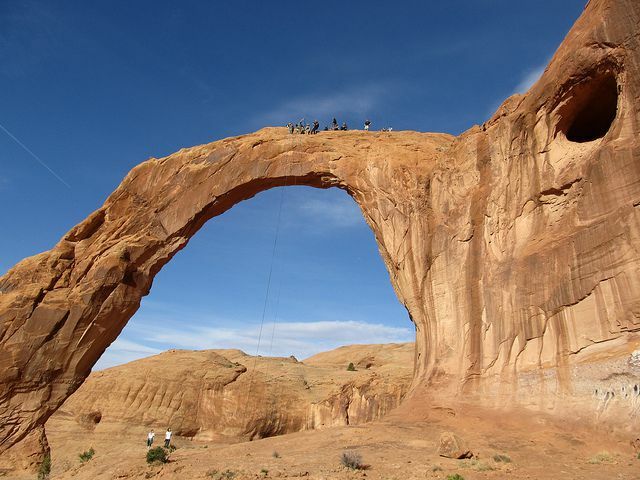 The park's iconic Corona Arch is increasingly being used as an over-sized apparatus for swinging, high-lining, and other activities. "After a handful of accidents and a rash of complaints, the federal government is weighing whether to crack down on the latest Internet-fueled thrill ride to crop up on public lands: extreme rope-swinging. The sport turns Moab’s unique collection of ancient stone arches into death-defying swing sets. People climb an arch, lash ropes to the rock and leap into the air, swinging earthward in a dizzying, 100-foot pendulum." While that may sound thrilling to some, the daredevil sport has led to three deaths in the last two years. The Bureau of Land Management, which oversees the park, is currently mulling whether or how to ban the activity in Arches National Park. Don't Ignore Your Surroundings While Taking a Selfie. This park tip comes from Portugal, where a Polish couple recently tumbled off of a cliff to their deaths while trying to take a selfie. This incredibly tragic story involves one of the most common things tourists like to do while visiting a National Park. Though no U.S. parks have recorded any accidental deaths by selfie, it is only a matter of time that they do. Don't Immerse Yourself in Nature Without Knowing the Risks. Thanks to stories like Jon Krakauer's Into the Wild, a real life story that ended tragically near Denali National Park, more park goers are inspired to go "off the grid" and immerse themselves in nature. While many hikers do this successfully, others have set out on a back-country trail and never returned. The risks are real, says Barbara J. King, whose husband, an experienced hiker, had to be rescued by a search and rescue team when he didn't return after a hike along Canyonlands National Park's Syncline Trail. "The terrain was physically fatiguing, my husband recounted when we talked, even more so than his pre-hike research had lead him to believe. After many hours of hiking, even while following the cairn trail markers, he became disoriented as to his location. Once his water ran out late in the day, the confusion associated with dehydration didn't help matters. "He's still not sure, even now, precisely how all this happened. But it did happen, and he slept on the trail that night as best he could, admiring a sky free from light pollution. Though he heard the helicopter and waved his arms, he couldn't be seen. At first light, he entered a wash to seek underground water. Standing there, about to dig, he was seen by the helicopter pilot." Bottom line: be careful out there; be mindful of your surroundings; and be respectful of nature and your fellow park goers. Follow these rules, and you should have a successful National Park visit.